OM’s foray into 360/VR began two years ago with simple stitching projects. 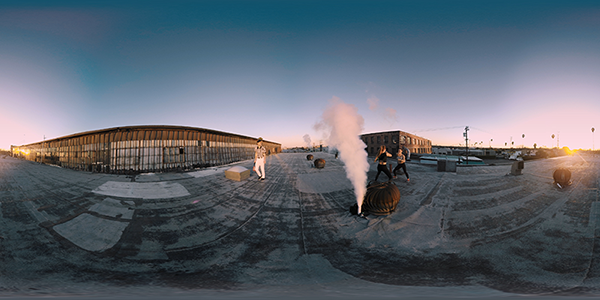 Since then, it has increased its 360 scope and refocused the studio’s efforts towards 360/VR productions. 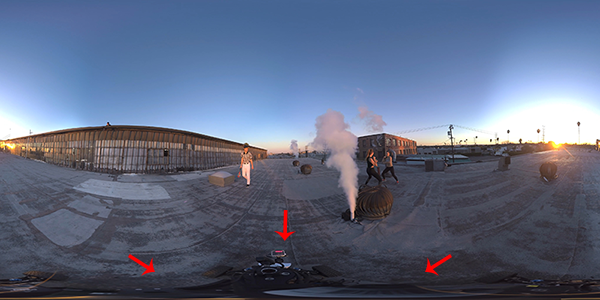 Projects are shot with a mix of GoPro-based camera rigs and spherical HDRs. Clients include: The United Nations, Volkswagen, Germany’s Next Top Model, FIFA, and more. “People tend to forget that every shot in 360 is a VFX shot as the tripod needs to be removed in every shot,” notes Burrer. “Having a convenient and robust workflow that does not slow down the entire production is crucial. We’ve used Mocha Pro for a long time. When Mocha VR was announced, it was a no-brainer as to whether we could use it for our projects.” Mocha VR’s Remove Module automates the camera removal process for significant time-savings in post. The studio turns to multiple toolkits to get the job done including The Foundry’s NUKE and Kara VR for advanced stitching; Adobe Premiere for editing; Adobe After Effects and Maxon Cinema 4D for motion graphics; Mettle Skybox; and DaVinci Resolve for color grading. Mocha Pro and Mocha VR round out these tools as a plug-in for Nuke, Adobe, and OFX. “For hardware, we have a SuperMicro render farm with 40 nodes and DELL CPU’s with dual 6-8 core xeons, and nVidia graphics cards,” adds Burrer. Recently, OM completed a big 360 project for Pro7 (a leading German TV channel) in conjunction with the car company Opel and Germany’s Next Top Model reality competition. The team did extensive previz in 3D before the shoot to ensure the director Uwe Flade and agency had a clear vision of every shot; down to the where the actors would be (and the extras), the props, and lighting gear. “I find it extremely important to have a consistent ‘gaze dramaturgy,’” comments Burrer. “That way the viewer never has the feeling of being lost or not being able to follow the story.” OM’s attention to detail was of great help to the LA-based art director and film crew who pulled off the complex shoot in one day! “We were lucky to be supported by Radiant Images in LA, as they have a crazy amount of experience shooting 360/VR,” continues Burrer.